Australian shipping is on its last legs and requires significant legislative and policy changes for it to be a viable transport option when considering the management of Australia’s domestic freight task. The number of Australian shipping vessels have fallen from over a hundred in the 1990’s to about a dozen today. Of these remaining ships none are container ships traversing our capital cities, which is surprising given most of our imports arrive in containers. International shipping lines manned by international crews undertake this freight task as part of operations to/from Asia, Europe and Oceania. The crews on these ships are paid Australian wages in accordance with government regulation. The end result does not benefit Australian shipping or Australian seafarers. Policy positions of Government over the last two decades has seen shipping become almost irrelevant in Australia's freight and supply chain mix. Our domestic trade movement by shipping only accounts for 15 per cent (down from 27 per cent in 2002). This numbers should be alarming given that we are an island nation that relies on over 98 per cent of its total trade with the world through shipping and have the fifth largest shipping task in the world. Shipping is the most efficient transport choice for the movement of large freight and results in significant benefits including, reducing congestion in our cities and fatalities on our roads, improving Australians' liveability and resulting in significantly fewer CO2 emissions. 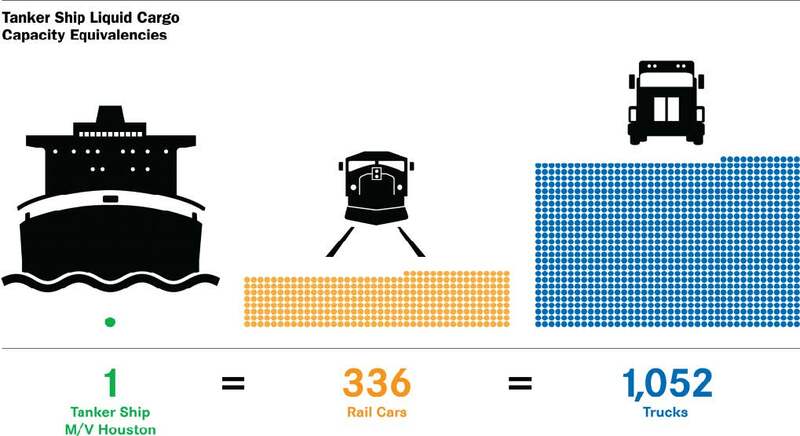 Shipping produces 1/5 the carbon emissions of road per tonne-km. Under a scenario in which 1 million tonnes of freight per annum is shifted from road to sea between Brisbane and Townsville, the reduction in accident costs would be approximately $30.7 million per annum. The ‘Blue Highway’ also does not need maintenance, and shipping does not damage the waterways. Greater use of our seas will lead to more goods being moved by ships and accordingly the Australian Government will not need to continuously increase investment in rail and road to ensure their maintenance. As a result greater funding can be allocated to issues such as health and education. With the national freight task expected to grow by 26 per cent by 2026, shipping can take the pressure off road and rail transport movements for non-time sensitive movement of goods.